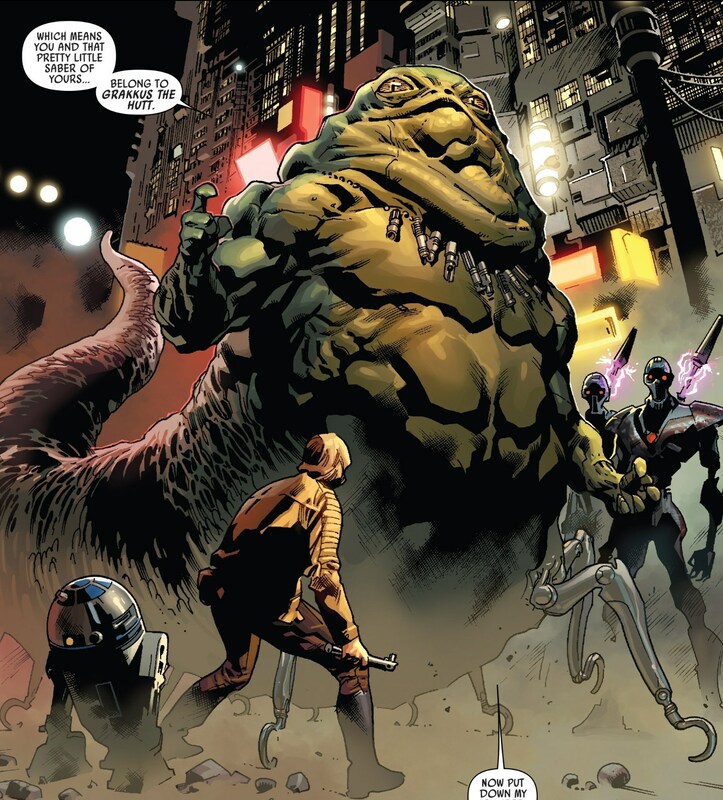 Mike Mayhew drawing actual characters in the Star Wars universe? Yes please! 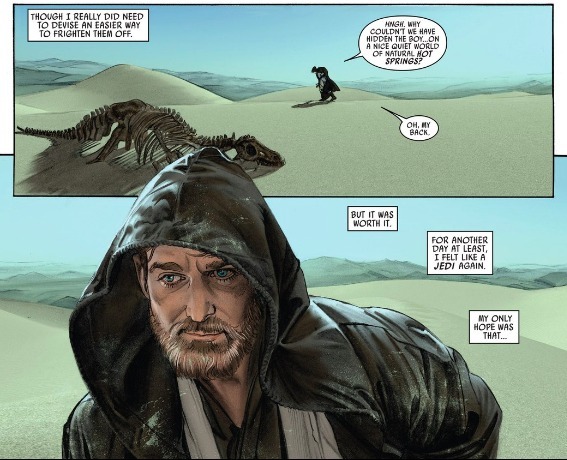 Star Wars #15 brings us a new chapter in the journal of Obi-Wan Kenobi. 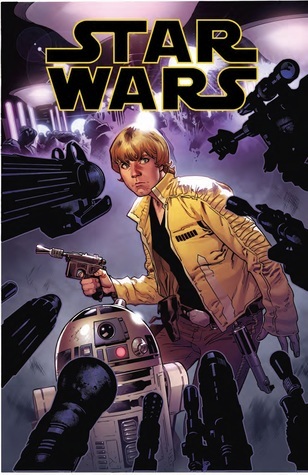 A year has passed since the events of Star Wars #7, and the former Jedi Master continues to look after young Luke Skywalker from afar. When Luke is in a minor flying accident, and his Uncle Owen grounds him (literally), Obi-Wan goes to great lengths to get Luke back in the air. Meanwhile, Jabba the Hutt continues to search for the one who foiled his plans during the drought. Obi-Wan may not stay hidden for long. 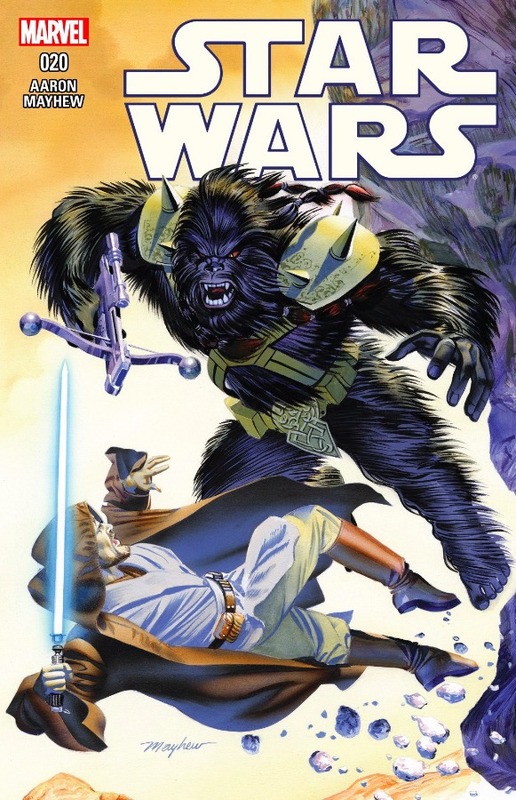 Star Wars fans may remember Mike Mayhew as the artist on The Star Wars, the comic book adaptation of one of George Lucas’ early drafts in the ’70s. Mayhew’s photorealistic style is beautiful. He made the characters, who were ultimately never meant to be seen, come to life as if we were somehow watching an alternate version of the original movie. The only major flaw I find in his work is that his characters can go over the top with their expressions, and venture into cartoony territory. We get some of that here. But it almost doesn’t matter, considering how gorgeous things are. 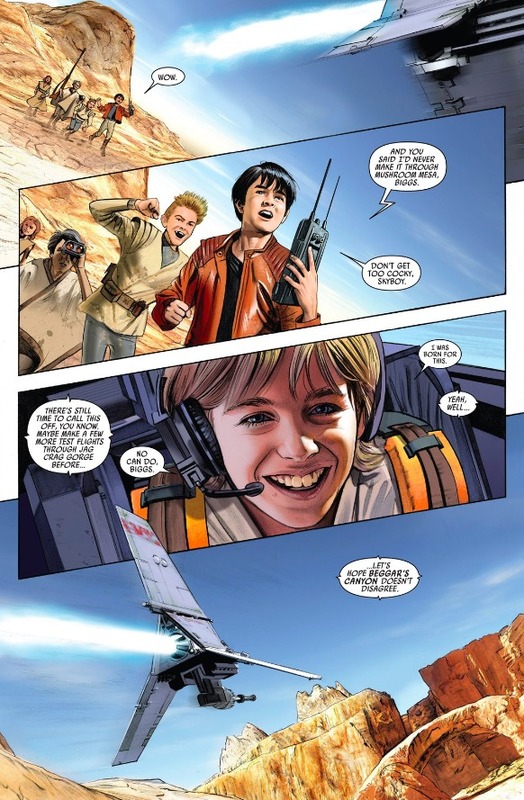 For instance, there’s a panel on page 5 that shows us Luke in the cockpit of his family’s T-16 Skyhopper. The sheer joy on his face, along with the superficial similarities to Mark Hamill in A New Hope, are enough to make you buy this kid as a young Luke Skywalker. As such, you’re immediately draw into the issue. I can’t understate how important this one panel is to the integrity of the entire story. You’re invested in him instantly. And as a bonus, we get a shot of a young Biggs Darklighter. But just two pages later, things get cartoony in a shot of Owen getting angry with his nephew, and Luke crossing his arms in defiance. It’s an interesting trade off, but the upside makes it worthwhile. 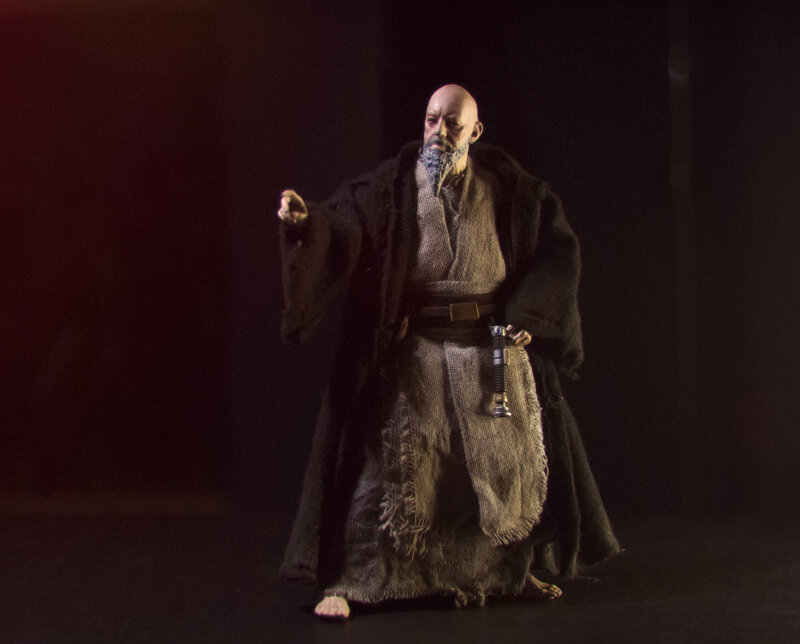 Mayhew’s Obi-Wan Kenobi doesn’t look like Ewan McGregor or Alec Guinness, but still manages to evoke the charm of the former, and the wisdom of the latter. As such, he’s believable. 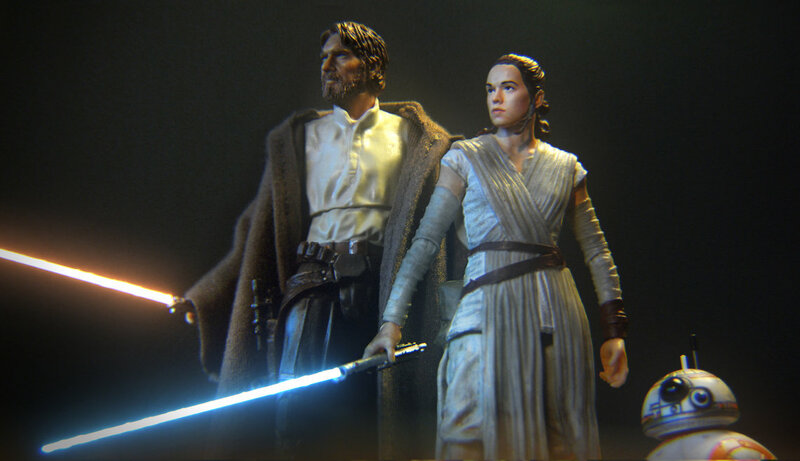 As was the case last time, we only get one lightsaber shot, and it’s used toward the end. This is appreciated, not just because of creators relying too heavily on the lightsaber, but because this issue presents an ample opportunity to utilize it. At about the halfway point, we get a gorgeous two-page spread depicting a fight between Obi-Wan and a bunch of Tusken Raiders. If ever there was a good excuse to whip out the lightsaber, this is it. Instead, our creators show restraint, and show us Obi-Wan doesn’t need the lightsaber to be a formidable opponent. I wish we saw this kind of thing more often. It beats the hell out of the lightsaber frenzy we saw in issue #12. I’ve had my share of bones to pick with Jason Aaron’s choices in this series. 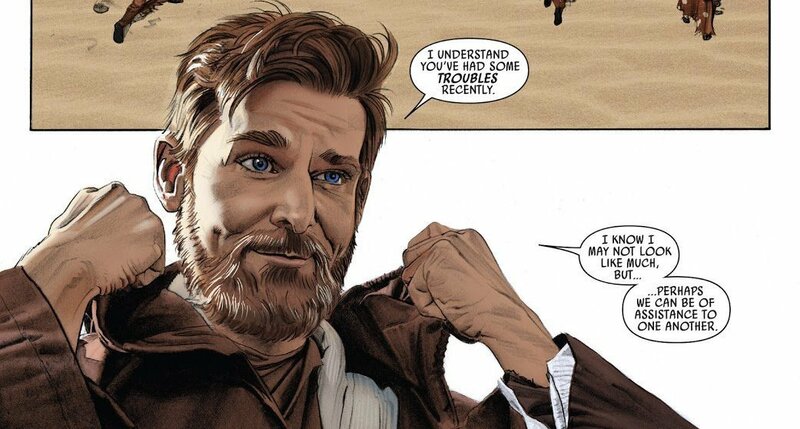 But these Obi-Wan journal issues have been fantastic. There’s so much potential for great storytelling here. 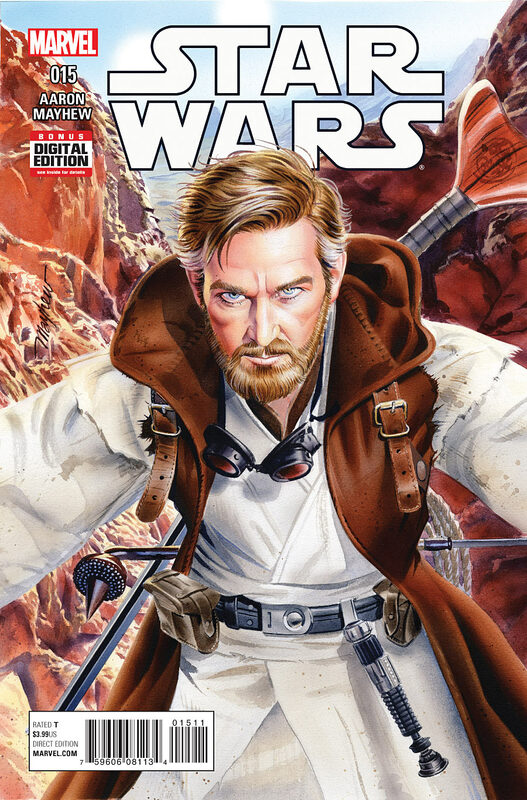 Aaron uses this issue to give us a firsthand look at the dynamic between Obi-Wan and Owen Lars. It’s a fine supplement to A New Hope, and is consistent with what we saw from both characters in the film. As evidenced by how we close this issue, this won’t be the last time we open the journal. As for Mike Mayhew, here’s hoping he comes back to Star Wars again in the near future. He’s got an entire galaxy left to explore. 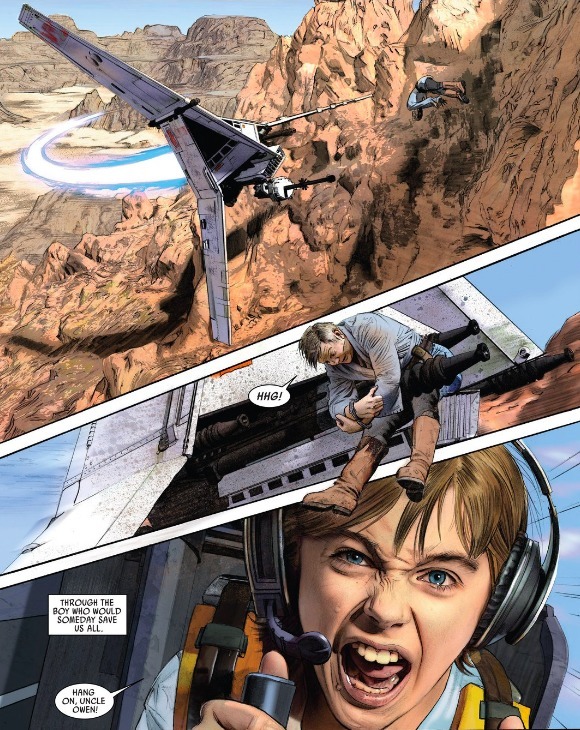 This entry was posted in Comic Books/Graphic Novels and tagged Ben Kenobi, Biggs Darklighter, comic book reviews, Jason Aaron, lightsaber, Luke Skywalker, Marvel, Mike Mayhew, Obi-Wan Kenobi, Owen Lars, single issue reviews, Star Wars, Star Wars #15 (2016), Star Wars comics, Star Wars: Episode IV - A New Hope, Tatooine, The Star Wars (Dark Horse Comics), Tusken Raiders on 01/23/2016 by primaryignition. A Star Wars, Vol. 2 Review – Mrs. Han Solo??? PENCILLERS: Stuart Immonen, SImon Bianchi. For further reading, check out our reviews of issue 7 and issue 8. Since getting the keys to Marvel’s Star Wars ongoing series, Jason Aaron’s writing has been fairly inconsistent in terms of quality. He’ll be great for an issue or two, then suddenly give us an eye-roller. Still, Aaron has definitely put together a book that delivers on the trademark Star Wars action and adventure that we love. So despite the eye-rollers, we still come back for more. After a glimpse into the journal of Obi-Wan Kenobi, Luke Skywalker sets out for the smuggler’s moon of Nar Shaddaa, hoping he’ll find someone who can get him on Coruscant and into the Jedi Temple discreetly. 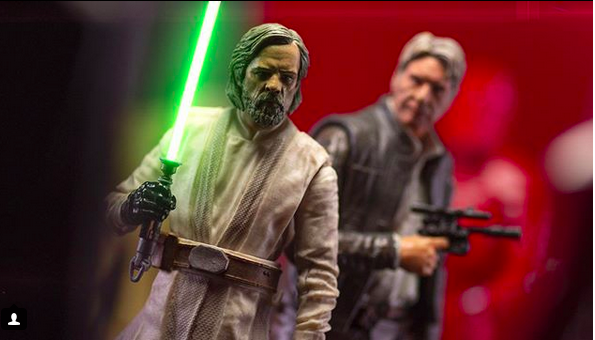 Unfortunately, Luke becomes the prisoner of a Hutt who fancies himself a collector of all things Jedi. Meanwhile, Sana Solo, the alleged wife of Han Solo, intends to collect the bounty on Princess Leia’s head. But first, they must survive a bombardment from the Empire. 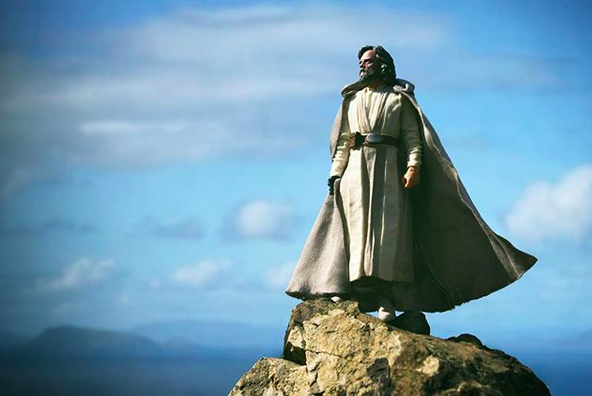 Plus, who’s going to rescue Luke? 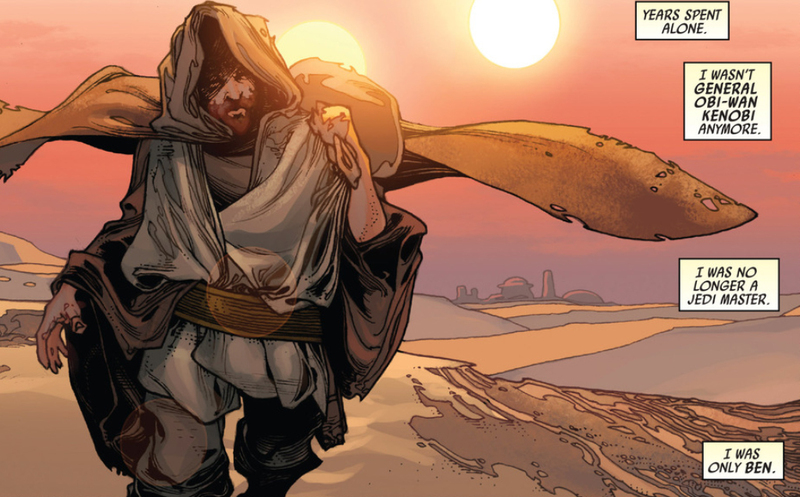 This book has a really strong start, as Aaron and Simone Bianchi give us a glimpse of Obi-Wan Kenobi’s maddening seclusion on Tatooine. Put plainly, it’s the best issue the Star Wars team has put out thus far. I’ve talked extensively about issue #7 before, but it bears a little repetition. Simone Bianchi’s art is haunting at times. Particularly memorable is a sequence in which Obi-Wan is meditating, and in his frustration, ends up lifting the bones of a long-dead creature out of the sand. There’s also a lone panel in which he’s sitting in his home alone in the dark, with nothing but agonizing time on his hands. I’m hoping we get more issues like this down the road. We then get into the main story, which deals largely with Sana Solo, Han’s alleged wife. Han spends much of the story in a state of fluster, saying things like: “Sana. Where did you…how…how did you…?” and ““Leia, don’t listen to her. It was never like that…She’s not my wife!” That gets old after awhile. But on the plus side, it is interesting to see Han get the tables turned on him like that. The downside of a story like this is that the end is fairly obvious. 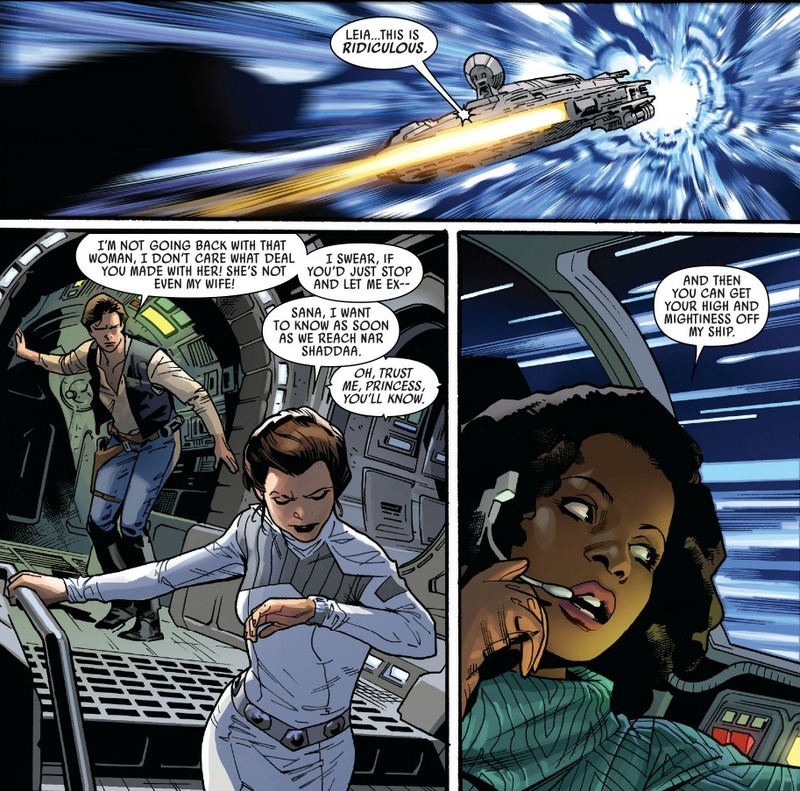 From her reveal in issue #6, we knew the chances of her actually being Han’s wife were pretty slim. Even if she was his wife, shenanigans were likely involved. So we knew that by the end of the story she’d be gone. As such, it’s tough to fully get invested in her. But it is interesting when we finally hear her backstory. Her ship is also pretty cool. It looks like a cousin of sorts to the Millennium Falcon. This book plays the lightsaber card pretty heavily. I’ve talked about the downside of what I call Frequent Lightsaber Activation (FLA) before, and it’s present in this book. It’s not entirely unjustified, because Luke does spend a lot of time in a combat scenario. 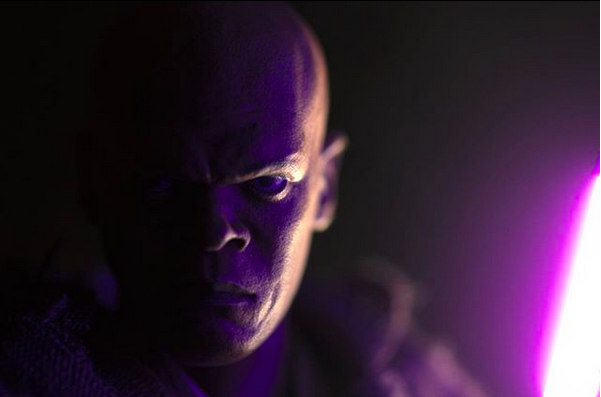 But there’s a scene where Luke goes into a cantina on Nar Shaddaa, and his lightsaber makes him a target. The story then starts to revolve around Luke protecting the weapon, then retrieving it, then being confronted by a Hutt with a bunch of lightsabers strung around his neck. Then at the end, we get a stunt involving our main characters and a bunch of lightsabers. It’s all a bit much for my tastes. I don’t doubt there’s some sort of editorial mandate to play up Anakin Skywalker’s lightsaber, as it will appear in The Force Awakens. But there’s something to be said for not overdoing it. On the plus side, Aaron writes an excellent C-3PO. In Showdown on the Smuggler’s Moon, Threepio travels with Chewbacca to Nar Shaddaa in an attempt to rescue Luke. But the duo go on a hunt for information before runing into Dengar, one of the bounty hunters seen in The Empire Strikes Back. 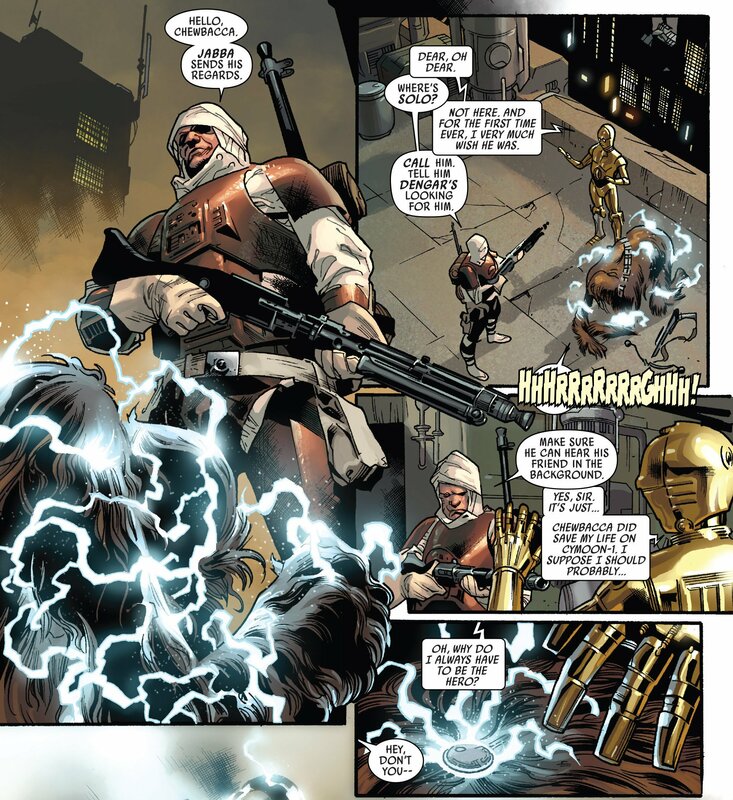 Threepio’s dialogue in issues #10 and #11 is fantastic. I loved the line, “Oh, why do I always have to be the hero?” Aaron’s portrayal of Threepio is one thing he’s been consistent with from the start. The fact that I’m a sucker for ol’ goldenrod doesn’t hurt either. Stuart Immonen does fantastic work here. The passion he’s putting into these pages is evident. He’s got the faces and mannerisms of the characters down pretty well. Immonen, inker Wade Von Grawbadger, and colorist Justin Ponsor do an excellent job with Nar Shaddaa as a whole. The sky is a gorgeous (relatively speaking) mix of browns, yellows, greens, and even light oranges to portray the pollution. They also give us a really good Chewbacca. A lot of artists forget that Chewie’s arms are relatively skinny. He wasn’t this big, muscled up gorilla, so much as he was really tall. Kudos to this team for giving us a pretty fair representation of Peter Mayhew in that costume. This crew also does most of the covers, and give us a fantastic one for issue #12. 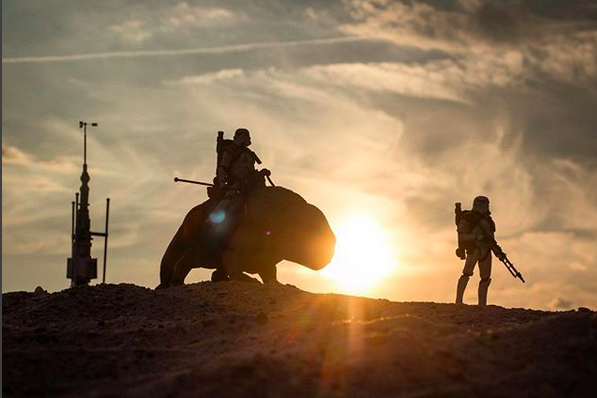 Our artists have definitely proven their worth as far as the Star Wars universe is concerned. As for Aaron, this volume shows definite improvement. He’ll be spending his next few issues on the Vader Down crossover. But he’s managed to keep my interest, and I’ll be sticking around to see what he does next. For more from Stuart Immonen, Wade Von Grawbadger, and Justin Ponsor, check out Ultimate Comics Spider-Man, Vol. 1: The World According to Peter Parker. This entry was posted in Comic Books/Graphic Novels and tagged C-3PO, Chewbacca, comic book reviews, comic books, Dengar, Han Solo, Justin Ponsor, lightsaber, Luke Skywalker, Marvel, Millennium Falcon, Nar Shaddaa, Obi-Wan Kenobi, Princess Leia, R2-D2, Rob Siebert, Sana Solo, Simone Bianchi, Star Wars, Star Wars #7 (2015), Star Wars #8 (2015), Star Wars (Marvel Series), Star Wars comics, Star Wars Vol. 2: Showdown on the Smuggler's Moon, Star Wars: The Force Awakens, Stuart Immonen, Tatooine, Wade Von Grawbadger on 12/02/2015 by primaryignition.